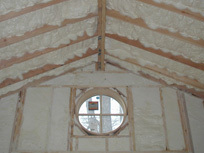 Icynene LD-C-50™ is a ½ lb/ft3 density, 100% water blown soft spray foam insulation and air barrier material. Its performance is less installation sensitive than factory manufactured insulation materials. It is an effective "breathing" air barrier that can adjust with the building to maintain a seal against energy robbing air leakage for the life of the building. Icynene is applied by spraying liquid components onto an open wall, crawl space or ceiling surface. It adheres to virtually all surfaces, sealing out air infiltration. Excess material is easily trimmed off, leaving a surface ready for drywall or other finish.